How gorgeous are these. Homemade and super yummy. The secret? Its beets! Place nori sheet on a cutting board and pick up some rice with wet hands. 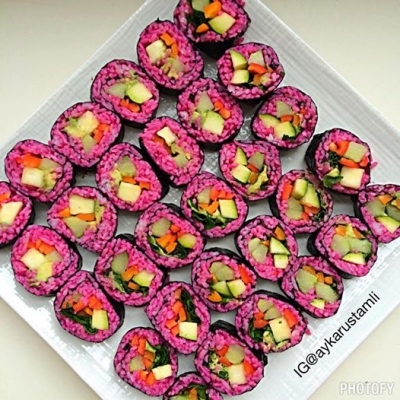 Spread the rice on the nori sheet, place your choice of filling and roll up! For rice: cook 1 cup sticky rice with 1,1/4 cup of water and then add a few tablespoons of beet juice.